Measles, whooping cough, and other diseases long thought to be history are making a comeback among schoolchildren in America. The measles outbreak that's struck more than a dozen states has prompted many questions, as it should, about the safety of American schoolchildren and the right of many parents opt not to vaccinate. Public health is becoming a major policy issue — and vaccines are something 2016 presidential candidates will have to grapple with. To the current guy in the White House, it's a pretty simple matter to understand. Press Secretary Josh Earnest commented that President Obama "believes it shouldn't require a law for people to exercise common sense and do the right thing." And Hillary, the projected Democratic frontrunner, Tweeted this week: "The science is clear. The earth is round, the sky is blue, and #vaccineswork. Let's protect all our kids. #GrandmothersKnowBest." Still, not everybody feels the issue is so cut-and-dry. 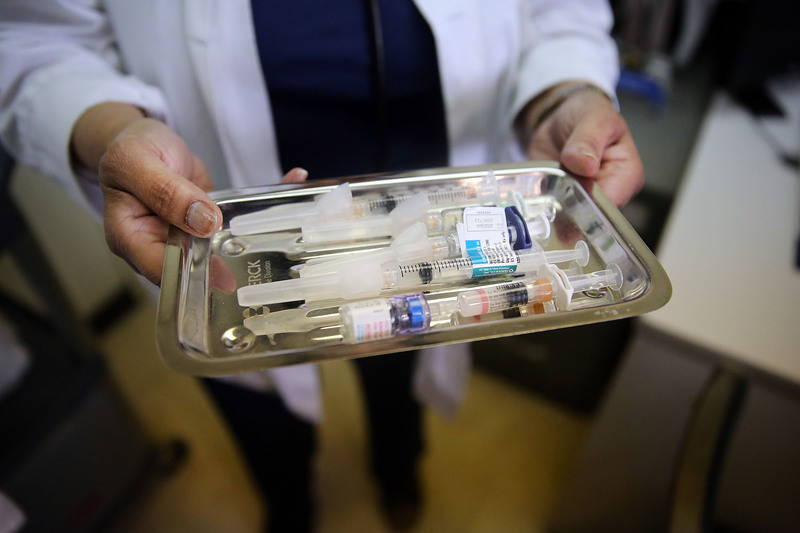 For some considering a presidential run at the end of next year, the issue of whether the state could be infringing upon on personal rights by requiring vaccinations is a major one. So, without further ado, here's a breakdown of what know about 2016 Republican candidates and their takes on the vaccination debate. I'm not arguing vaccines are a bad idea. I think they are a good thing. But I think the parent should have some input. The state doesn't own our children. Parents own the children. But the senator is clearly not afraid of the needle himself. Certain communicable diseases have been largely eradicated by immunization policies in this country and we should not allow those diseases to return by foregoing safe immunization programs, for philosophical, religious or other reasons when we have the means to eradicate them. I also understand that parents need to have some measure of choice in things as well. So that’s the balance that the government has to decide. ...with a disease like measles, there is no question kids should be vaccinated. At the same time, different states require different degrees of vaccination, which is why he was calling for balance in which ones government should mandate. I think that state governments can allow public schools to say that a child who hasn’t been immunized against an infectious disease that poses a public health risk can’t come to school. And of course there’s some immunizations that don’t have anything to do with public health. Not all immunizations are the same. There’s a big difference between an immunization for measles and HPV. There is a lot of fear-mongering out there on this. I think it is irresponsible for leaders to undermine the public's confidence in vaccinations that have been tested and proven to protect public health. Science supports them and they keep our children safe from potentially deadly but preventable diseases. He concluded by saying: "Personally, I would not send my kids to a school that did not require vaccinations."